The work was carried out by Mark from Lion Logo’s of Ashford, (01233 220317), the service from Mark was first class, and was quite happy to amend the Logo and map as many times as we wanted until we were happy with the design. I’d thoroughly recommend Lion Logo’s for car wraps, van sign writing, web design etc. The fitting was carried out in a tyre fitting bay, near Woodchurch, and as soon as I looked at the height of the roller shutter door, I thought blimey that’s gonna be tight! I know that the height of the truck at the highest point is 3.5m, and after talking to the workshop owner he confirmed that the door clearance WAS 3.6m, but the shutter refuses to rise all the way in, so it was a case of reversing very slowly into the bay with a couple of guys strategically placed on ladders to check it would clear. Apparently there was about half an inch clearance. Very tight indeed. About 4 hours later, Colonel K had his new livery. It was great to get a run out in the Daf, and obviously it’s always a good thing to move it, and give it a blast. It was -2c when I collected it, and the engine oil was thick and it was definitely more of effort for the starter motor to turn over the big 6 litre engine, but as always, the old boy fired up first time. But it did take me a good 10 minutes to de-ice the windscreen and side windows before I could move off. 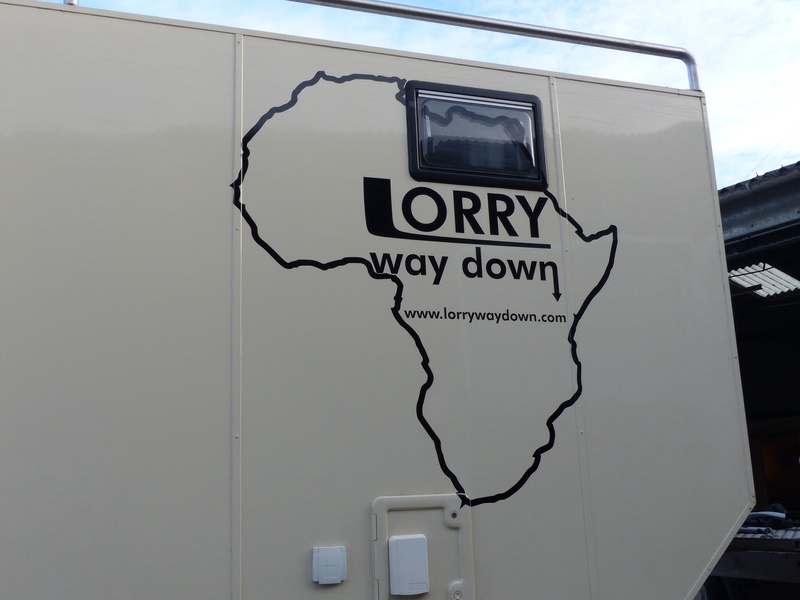 The principle purpose of the logo (apart from pimping up the truck), is to promote the website. 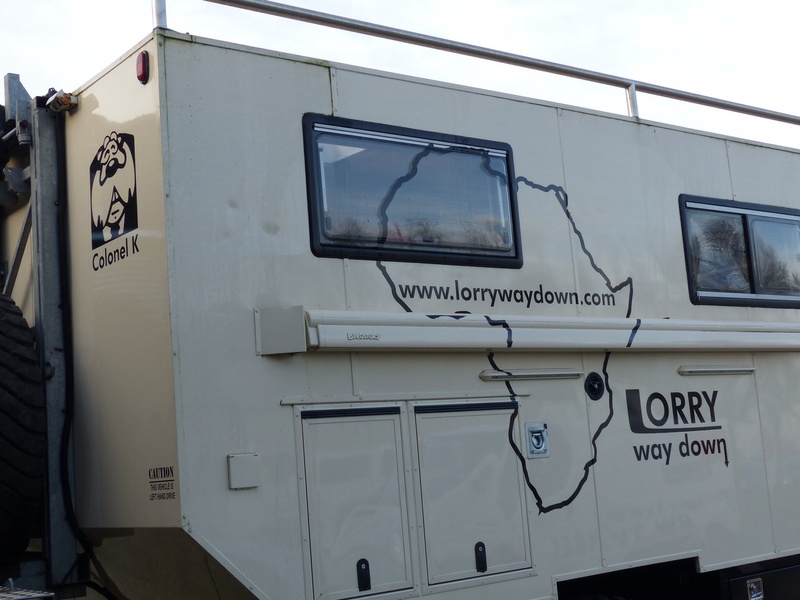 The eagled eyed among you, will have noticed the slight play on words, with a certain celebrity and his mate that did a fully backed up ride round the world (The Long Way Round), then a similar mega budget trip from London to Cape Town (The Long Way Down). Those that know me, will understand my passion for all things motorbikes. So will also understand my dislike of the BMW GS1200 Adventure that Ewan McGregor and err…. em…. err…. his mate used on this mega hyped and highly successful jolly. 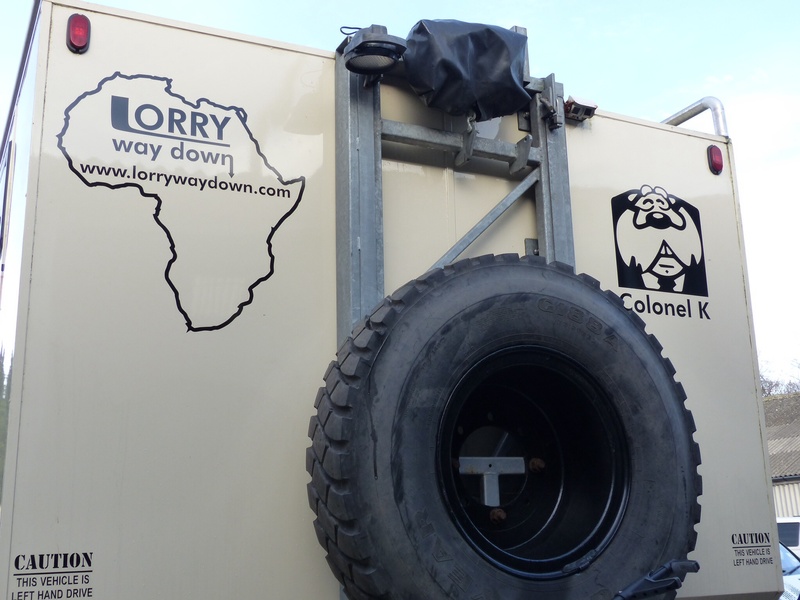 So it seemed fitting to use their font and a play on words over a map of Africa, on The Colonel. And of course the irony is, we will have absolutely no backup, no pre organised visas, no luxury hotels, and alas no TV crews! The Colonel has now been tucked up for the winter, and will proberly stay in the storage compound until MOT time in February. With a fair wind behind us hopefully we will be heading South shortly afterwards. /I am nit sure if have seen it – I created a link from our blog http://www.unterwegshoch4x4.com to your blog. If you don´t want this – please give me a short reply. As I wrote in my comment – do you have some information how you mounted the front winch? Hi Micheal, the link is fine. The front winch is a Champion 17500 model and is mounted back to the chassis via a custom made bracket. This was fitted by the company that carried out the conversation. The GS wheel will probably get you out of trouble……..Reliable as ever!!!!!! Clive, I guess that makes the GS wheel the only reliable part of the bike!